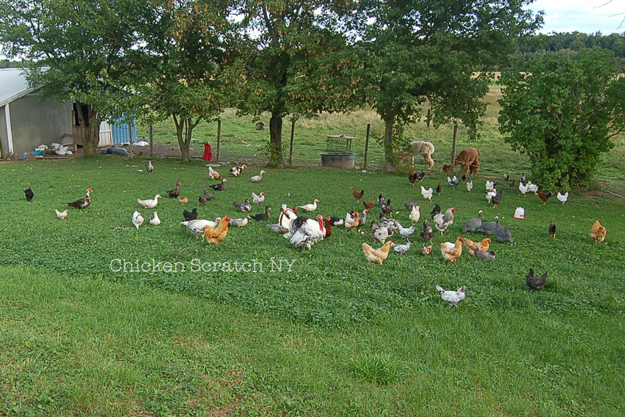 I’ve got a lot going on between the kids, the house pets, the alpacas, the chickens and the rest of the flock so I try to keep simple routines. 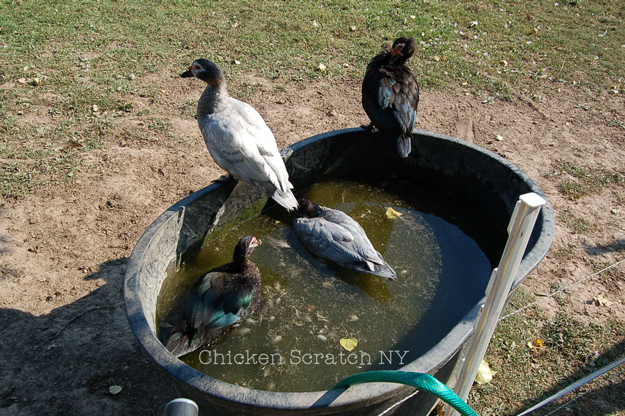 The easiest keepers I have are the Muscovy ducks, hands down. 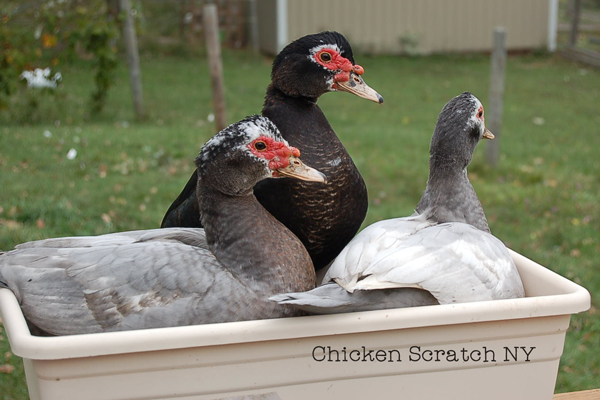 I’m not the only one who thinks that way either, when I put together my post about Favorite Chicken Breeds Mike from Gentleman Homesteader shared that Muscovy are his his favorites too, you can read why on his post about Adding Muscovy Ducks to the Homestead. All of my ducks are Muscovy, sometimes called Alligator ducks. They aren’t the cute white pekin ducks or green headed mallards you might be familiar with. Mine are black, brown, grey and white with red eye masks and bumps called caruncles. They aren’t even that closely related to other ducks. Muscovy don’t even quack. They do make noses though, including an angry hiss. They have lots of personality! When the they get angry (either at each other or if the dog walks to close) they flare up a Mohawk of feathers and bob their heads while strutting away. I’ve even seen a few hold their ground and bite the dog if he invaded their bubble. I started with a group of 6 ducklings from my mother in law and a pair of juveniles I received as a house warming gift (because we have the best sort of friends) in 2011. Since then I’ve fluctuated between 20 and 40 ducks. 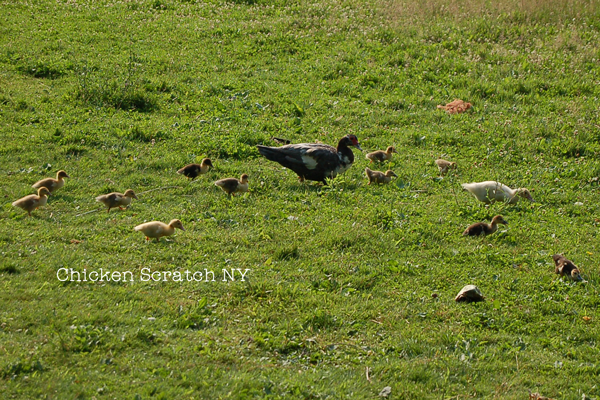 I can’t really be sure, aside from counting the ducklings I don’t do much to keep track of them. Other than filling up a wading pool from time to time I don’t do anything special for them at all. The lady above is one of my gold star mamas, the two greenish looking eggs on the left are duds, she knew it and rolled them out of the nest. The rest of those eggs hatched; you can see the wet one in the front that was fresh out and there’s one pipped just behind it. And they’re thriving. The group above is oddly small but I think it had something to do with her nest being on the ground and her eggs rolling away. Mama is in the brown in the back right and not-the-dad is black. 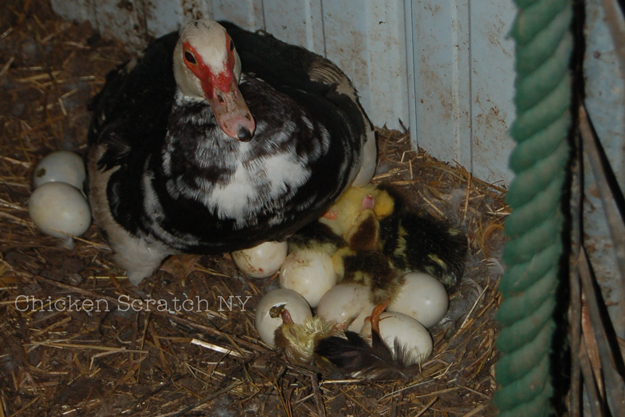 Every year we get large clutches of ducklings (one mama hatched 21!). 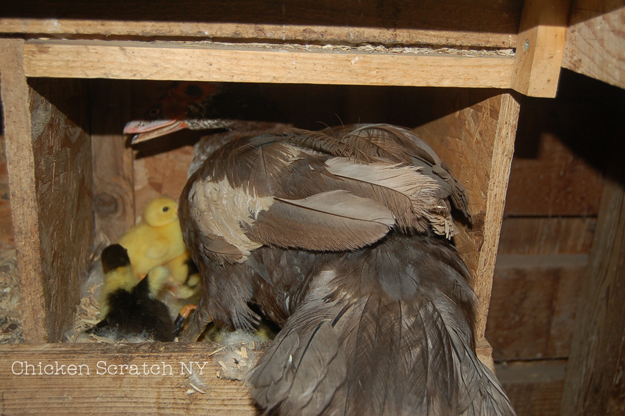 Most of the moms are great but I’ve had a few duds that hatch out babies and then neglect them. Luckily we always have a few clutches at once and the other moms will adopt the babies. The picture above is one of the adoptive mamas, the larger white duckling isn’t hers but she raised him and his four siblings with her younger babies. They make nests in the nest boxes, you can tell it’s the ducks because they’ll pull out their down to line the nest, or on the ground. I try to get them to nest in the barn but on the occasion they don’t and I’ve never been able to successfully move a nest once they’re sitting. After a few day in seclusion they’re out and about with mom exploring puddles and eating bugs.I used to let them do their thing 100% but we had a few incidents where the moms were taking the babies across the road they they were getting stuck so now I pen them up for a few days. On the rare occasion that I have to bring the babies inside I’ll feed them grower but the barn babies get what ever scratch they can find and what ever mom finds for them. It seems to be working for them too, they grow up fast and healthy. Muscovy are great because you can tell the boys from girls at about 8 weeks old. The boys get much bigger and the size difference quickly allows you identify them. That also means they’re ready for the dinner table quickly without all the issues of raising cornish crosses. It’s a little hard to tell in the picture but the mama is black in the center with the red mask, the ducks on the far left and far right are females and the rest are males. They are amazing foragers, even now with lake effect snow falling and a few inches on the ground I’ve got a whole troop wandering the back field snacking on seeds and what ever else they’re finding. In the summer they’re the first out the door and the last in, they’ll stay out long after the chickens and on nights with a full moon they’ll be out until I round them up and into the barn. If not for the large local fox population I’d let them stay out all night. Muscovy don’t require a pond, just water deep enough to keep their nostrils clean. 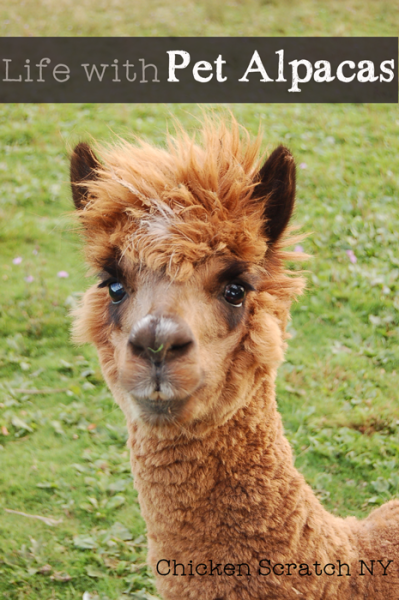 I do offer them a kiddie pool in the summer in an attempt to keep them out of the stock tank for the alpacas. They will make a mess of your waterers so I like to keep a few rubber bowls full of water for them, sometimes you also get to see ducklings swimming and that’s the cutest thing ever. If I have duckling around I put a brick or large rock in the bowls to help them get out so they don’t get stuck. Ducklings can drown and they’re pretty good at getting into trouble. I keep the Muscovy ducks because they eat lots of snails and insect larvae, they lay delicious eggs (duck eggs are much richer than chicken eggs, the yolks are thicker and my boss swears they’re the best for baking) and we eat them. 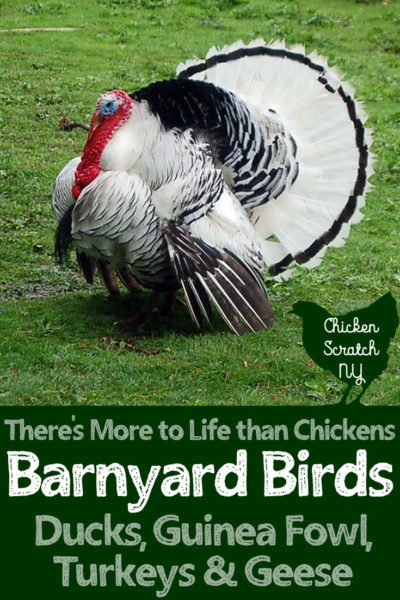 An early summer hatch will provide your family with lots of cheap meat from the boys and eggs come spring time from the girls. Right now I’ve got a bunch of boys in a separate coop waiting for the freezer but the girls and a few boys live with the chickens. 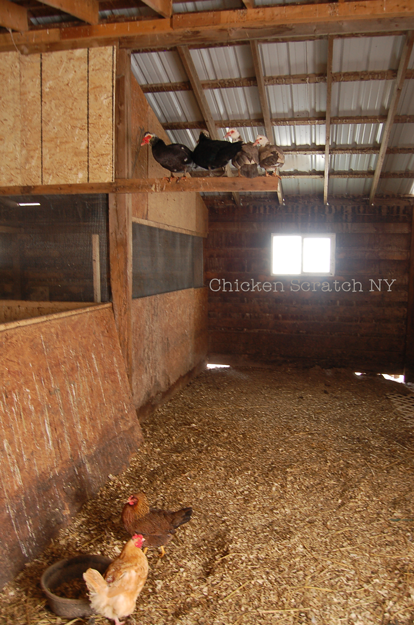 The roost above is the result of bad math in the coop expansion. The area the the left with the hardware cloth screening is the coop. The roost is about 7 feet off the ground, there is absolutely no reason for the ducks to be up there but that’s how they roll. A few of the females roost with the chickens but the majority (including 4 late September ducklings) spend their nights on the coop floor in the thick shavings. We keep the waterer out of the coop, they can make a big mess from a little water, and we keep a large gravity feeder full off grower, corn, layer or scratch. 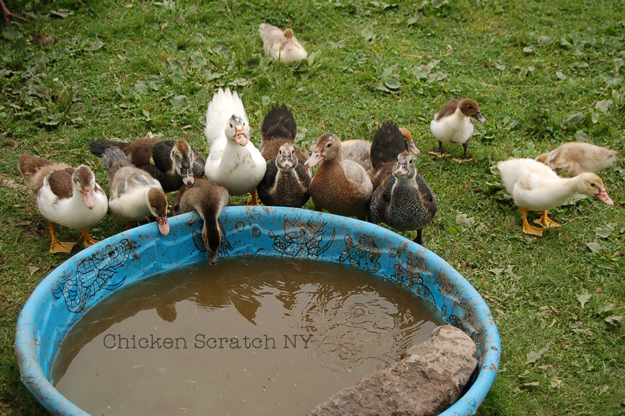 I feed a bucket of fermented or soaked whole grains to everyone each night and the ducks eat right along with the chickens, turkeys and guineas. , it’s easy to find and covers all the basics. 2018 – I’m down to two male muscovy ducks after a bad predator year in 2017. I really need to get some more to help with the snail problem (snails carry the parasite that made my alpacas very sick). Two males aren’t good at making babies so for now I’m SOL. I think I missed my chance this year unless I can find someone looking to get rid of extra ducklings this fall. They sure are cute little things! I am glad to know more about them, and the information you gave was wonderful! That was a delightful read! I noticed that the duck eggs look very smooth and slick – unlike chicken or turkey eggs which have a little bit of texture. Are duck shells oily, like the duck meat? Great catch! They’re actually a little waxy. I can always tell which eggs I’m holding just by the feel of them. 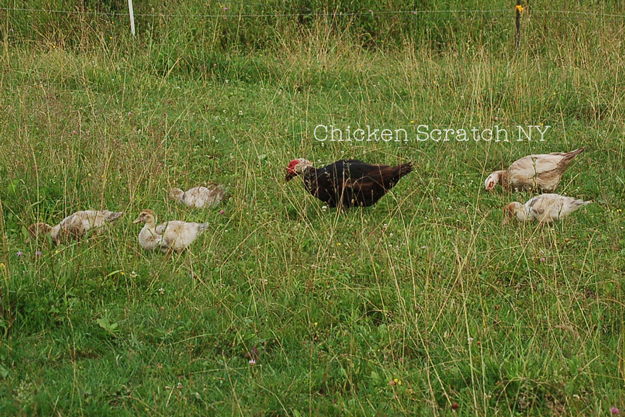 They also tend to be a little rounder than chicken eggs without the obviou small end. Muscovy meat is actually more like steak than regular duck meat. They don’t have as much fat. Great information! Thank you so much for posting this. I’ve recently been thinking of adding ducks to my myriad of animals (horses, chickens and dogs), and you’ve provided a lot of information and some things to think about. Best of luck in the New Year! I really love these guys, if you’re looking for birds with personality that don’t need to be coddled they are 100% the way to go! Your husband would fit in very well at our house lol, the zombie apocalypse is a favorite topic around here! But I love the ducks, I’ve been seeing more and more stuff that is making think I’ll want both chickens and ducks on our homestead when we have the property. Great description of these ducks! 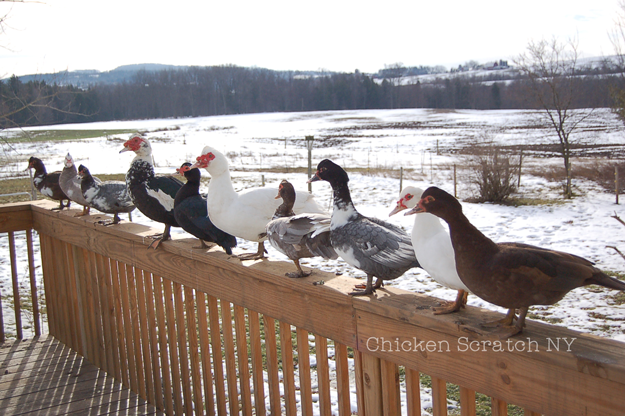 I love the photo of them all lined up on the deck rail. Our dryer used to vent right there under the deck. They’d be wing to wing all along the railing all winter long waiting for the next load of laundry! I enjoyed the read. Do you have any recommendations for deciding which boys to keep? 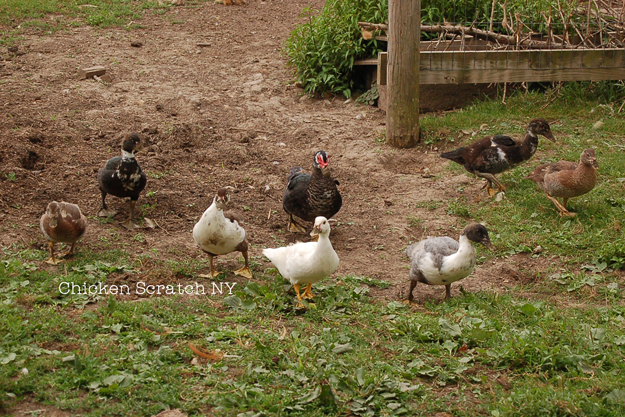 We had 2 hatches of muscovies last year and it’s time to make some decisions in that regard. There is a beautiful boy whom I’d like to keep but he’s smaller than the other guys so we may not want to perpetuate those gene. Thanks in advance! They stay in the barn with the other birds (chickens, geese and guinea fowl). The hardest part is keeping the coop dry. They need a place to dunk their faces and they can easily make a huge mess. I keep the water out of the coop all the time and out of the barn entirely when possible. Unfortunately we have a few weeks every year where there is too much snow to keep anything outside. The ducks don’t seem to mind the snow or cold very much. The even walk right on top as long as the snow isn’t too fluffy.